Last month I had the pleasure of speaking at the NDC conference in Oslo talking about .NET Core and AWS Serverless technologies. The talk focused around a new reference application I have been working on called Pollster. Two years ago at the 2015 AWS re:Invent conference we demoed a version of Pollster using .NET Core, which was back then called ASP.NET 5, and Docker. It was great revisiting this app and think of how to solve the technology challenges of the app using Serverless technology. Thanks to the NDC team a screencast of my talk has been uploaded. 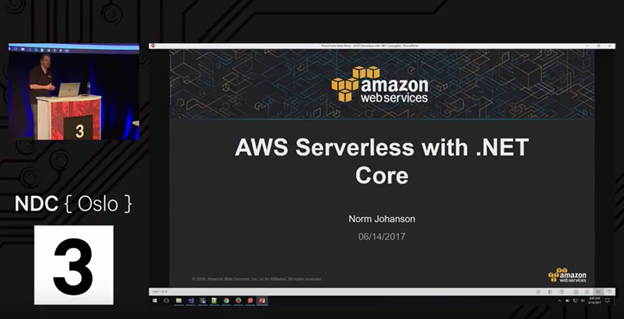 Check out the screencast and see how I used AWS Serverless services like AWS Lambda, Amazon API Gateway and AWS Step Functions. The application isn’t feature complete yet but you can find the source on GitHub.